In another blog post I talked about switching to ultra-light guitar strings to help alleviate finger and hand pain. That sparked emails from readers asking if I have any other hand-saving tips. In fact, yes, there are a few other things you can do to make playing guitar less painful. Disclaimer: I’m not a doctor, so when it comes to hand pain that is the result of a medical condition (arthritis, repetitive strain injury, etc), I can’t guarantee that the suggestions in this article will eliminate your pain. But, they just might. Or, at the very least, they may reduce your pain to a manageable level. Sore fingers? Try ultra-light guitar strings. You don’t have to stick with them permanently, but at least give them a try. Once your finger or hand pain subsides, you can move up to heavier strings if you’d like. I, however, now use ultra light strings exclusively on my acoustic guitar–and I absolutely love them. I suffer from arthritis in my fretting hand, and these strings have helped immensely. 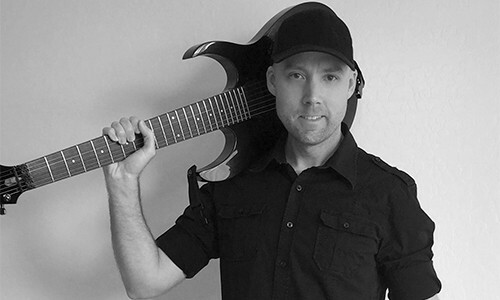 This is one of the most common technique mistakes I see: Pressing as close to the metal fret as possible (without muting the note) requires less downward pressure than if you press down somewhere in the middle of the fret. Not only is this just good fretting technique, it translates into less finger and hand soreness. You’ll be able to play longer before having to take a break–a necessity if you’re trying to play through full songs. Because of my arthritis, I now have to warm up first whenever I set down to play guitar. If the pain you feel in your hand is in the tendons, joints, or muscles, then you should be warming up before you play (after you’ve seen a doctor, of course). If you’re not yet having these kinds of symptoms, warm up anyway. It’ll help you prevent injury in the future. Essentially, your “warmup” can be whatever you want it to be, as long as you’re playing very slowly and carefully at first, and playing things that aren’t too taxing on your joints, tendons, and muscles. Keep yourself playing at a very slow speed for 10-15 minutes, and resist the urge to speed up and start jamming. Only after 10-15 minutes of taking it slow and easy should you begin to increase speed and difficulty. You’ll feel the difference, and you’ll play much better if you warm up first. Okay, admittedly this one’s a case of “do what I say, not what I do.” To be honest, I rarely stretch before I play, even though I’ve been advised to do so by doctors and other guitarists. Fact is, spending just 2-3 minutes carefully stretching your fingers, wrists, forearms, and even shoulders before playing guitar is a very good idea, especially if you’re dealing with a medical condition that interferes with your playing. It’s also a good idea to occasionally stop and stretch during your guitar practice. Firstly, I’ve neither tried these nor am I endorsing them, and I wouldn’t normally advocate putting something on your fingers. However, there are some (rare) medical conditions that may prevent some people from playing guitar, because they bruise easily. If you’re one of those trying to manage such a medical condition, finger caps like these may finally allow you to play guitar. If you try (or have tried) them, please let me know in the comments below. I can’t even begin to guess how many ex-guitarists I’ve met over the years who tell me they gave up guitar due to finger or hand pain. Some quit while they were still learning–before they could really get very far. Others were more experienced players who eventually quit because they developed arthritis or some other medical condition. It’s a real shame–I hate hearing that hand pain caused someone to give up the guitar. However, you do have options, and I hope that something (or a combination of things) from this article help you get back to playing. Of course, if you have pain in your hands that will not go away, it’s time to visit a doctor. 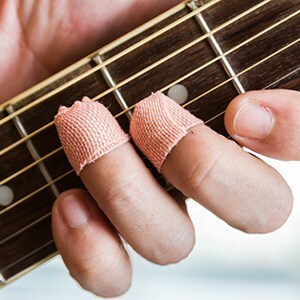 Are you currently suffering from hand or finger pain when you play guitar, and have you tried anything to alleviate it? Let me know in the comments section down below. Hi Momna. To my knowledge, there aren’t any guitars that are specially constructed for people with arthritis. I would recommend that your friend consult with a physical therapist who might be able to teach him stretching and warm-up exercises for his hands and fingers that might help. That, combined with a very low string height and very light strings might help your friend tolerate (but probably not eliminate) arthritis pain when playing guitar. A recommendation … for tender fingertips … OralGel. Just put it on, let it dry, and play. I am currently dealing with significant pain in my second joint, first finger. And it frequently becomes disjointed as I sleep. I feel certain it is from holding my pic too tight (and being old). So far I haven’t found any perfect solution. Hi Jim–thanks for the OraGel tip, I’ll give that a try sometime! If anyone reading this tries it before I do, please post here and let everyone know how it worked out. I started getting pain in the base of my thumb and wrist of my fretting hand. After a while I was losing feeling in my thumb. I really had to cut down my playing time because I was in so much pain even after warming up and stretching my wrist and fingers. I started searching for products to help with the pain, even tried wearing a brace on my fretting hand but it was very uncomfortable. I did find this product and wanted to share. It’s called a Sips-Grip, saw it on Facebook. I tried it and it actually helped. It’s actually quite simple, it fills the gap between my fretting hand and the guitar neck so I can hold the guitar neck with the palm of my hand and really not use my thumb at all. Just thought I’d share. Very interesting. This is exactly why some people feel that fatter guitar necks are more comfortable and result in less pain/strain. A fatter neck fills that palm-gap a bit more, and this device seems to play on that principle by filling in the gap. Thanks for sharing! My fingers always get bruised while playing guitar so, i am going to check out the finger caps. I’ve been playing in an almost strictly-rhythm context for 30-ish years. Recently I got the bug to pick up some lead technique (got tired of friends of mine lording it over me). Took a very back-to-basics approach to learning, and I started by doing continuous, timed chromatic runs several times up and down the neck at increasing tempo, to improve my timing and left-hand accuracy. My problem is that, never having developed proper technique, I have a hard time bringing my pinky right down with the tip on the string behind the fret. At faster tempos, it almost always comes down along one side or the other (depending on how high up the neck I am). And this has caused chronic soreness in that last bit, the fleshy pad. So far the only thing that helps, temporarily, is to take a couple days off, but then I feel the loss-of-practice crunch. This doesn’t seem to fall under tendonitis, arthritis or muscle pain. It’s like a blunt-trauma injury or crush injury. Am I doomed to just continue feeling this forever? Is there a way I can constrain my pinky to coming down properly on the string? What you’re experiencing is actually pretty common since, for most people, the pinky naturally curves inward toward the palm of the hand. This makes it nearly impossible to bring the pinky down flat/straight onto a string–depending on what you’re playing. 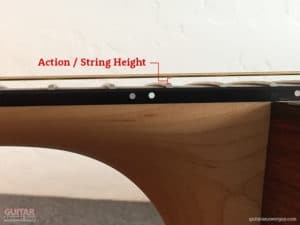 Since we’re all anatomically built this way, there’s not going to be much you can do to actually change the way your pinky is aligned or how it comes down on the fretboard. The fact is, it just naturally curves inward a bit, meaning you’re always going to come down on the side–usually the outside–instead of dead flat. So, you’re just going to have to build the calluses on those outside bits of your pinky. What I’d suggest (and this is what I do) is to not play to the point that you HAVE to take a couple days off. First off, let it heal up completely, if you haven’t already. Take as much time off as you need. After you’re digit has recovered, only play to the point that it JUST starts to become uncomfortable. Then stop. Don’t play again until your normal practice time the next day–which’ll give your pinky time to recover. Wash, rinse, repeat. Pay attention to how your pinky is feeling and only increase your practice time by a few minutes if you’re feeling pretty good. It’ll take time, but you’ll gradually find your pinky getting tougher and tougher, and you’ll gradually gain the ability to play longer and longer. A common mistake we guitarists make is to “play through the pain” and actually over-practice. Sometimes it’s because we’re simply having fun and don’t want to stop, other times we feel it’s some kind of right-of-passage. Whatever the reason, it’s a problem because when we hurt ourselves to the point that we can’t touch a guitar for days or weeks, it creates a significant setback in our progress as guitarists. It’s much better to practice for only 10-15 minutes EVERY DAY rather than practicing for a longer period, but sporadically and only a couple times per week. So, in summary, I can’t give any suggestions as to how you can change your pinky’s angle on the string, but I don’t think that’s your issue. I think you’re pushing it a bit, and need to gradually build up that pinky callus. Hi Andrew. I think the idea came from Tony Iommi–who uses custom-made finger caps (made from leather, I believe). I guess it was only a matter of time before some entrepreneur ran with the idea. Now, these silicone caps are all over Amazon and Ebay. I’m wondering if there are any supplements I can take, vitamin wise? Hi Dixie. I can’t recommend any vitamins, but there’s a cream that I use called Penetrex. I’ve often contemplated revising this article to include it, because I’ve had such success with it as a topical pain releiver. I love the stuff, but of course the usual disclaimer applies here: I’m not a doctor, and not qualified to give medical advice. Also, even though Penetrex works for me, I can’t guarantee it’ll work for you. That said, if you do try it, please let me know how it went. I’m pretty amazed with the stuff. Hi – This is really interesting – I have been a semi – professional in New England and Texas for over 30 years and my hands are turning on me. Playing a 3 hour set is getting hard. Hand arthritis runs in my family and all the guitar playing can’t help. I’ll try the 10 gauge strings and try the stretching. I’ll check back and let you know how it is going. How “easy” an acoustic (or electric, for that matter) plays has far more to do with the string gauge and action than anything else. So, I wouldn’t worry too much about trying to find a different guitar. Try the lighter strings, and be sure your guitar is set up for the lowest action possible (at the nut and bridge) without too much buzzing. I was diagnosed some years ago with tendonitis in both hands/wrists and shoulders, before I started guitar lessons and I can’t take any medication for this (the result of over 25 years of working in administration and constant touch typing!) My tutor showed me some stretching exercises, which I found really useful for my hands and shoulders. One thing I have found helpful when my hands ache is using arnica cream – although you have to keep it away from minor scratches or cuts – as this seems to ease the aching very quickly. Although my doctor did advise me to rest my hands when the tendonitis flares up, I soon realised that this doesn’t work for me, in fact I tend to pick up some knitting or crochet as the movement seems to ease the pain. I suspected that that might be problem with finger caps of any kind. 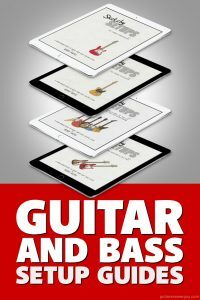 Tony Iommi somehow made them work, but of course that was after years of experimentation (and frustration, I’m sure) before landing on a custom-made solution that works for him. I think they may still be an okay option for total beginners, but as soon as someone starts playing faster and doing faster chord changes, cheap silicon finger caps will probably just get in the way. I’m going to research some more and see if there is a better solution (e.g. caps that are custom fitted and/or made from better materials).